Literacy is a gift every child deserves. 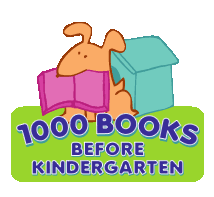 Reading aloud and talking together every day creates secure relationships and a strong foundation for learning. Books should be part of every family’s daily routines. 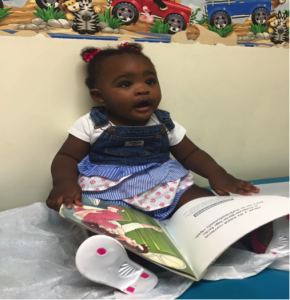 At DPC we promote reading at every visit for all ages. 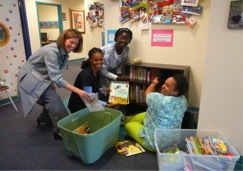 We are proud of our book donation program where we encourage our patients to donate their gently used books to our “bookcase” where other patients can choose a book to take home and enjoy. We are proud to support the DeKalb Library Foundation’s initiative. Great age specific suggestions can be found here. Books with simple, large pictures or designswith bright colors. Stiff cardboard, “chunky” books, or fold out books that can be propped up in the crib. Brightly colored “chunky” board books to touch and taste! Books with their favorite TV characters inside. Read or share stories at bedtime or on the bus. Children can learn from you that books are fun, which is an important ingredient in learning to read. Young children can only sit for a few minutes for a story, but as they grow, they will be able to sit longer. You do not have to read the words to tell a story. Babies need board books and help turning pages, but a three-year-old can do it alone. Remember, it’s OK to skip pages! Run your finger along the words as you read them, from left to right. Talk about your own family, pets, or community when you are reading about others in a story. Use the story to engage in conversation and to talk about familiar activities and objects.